Enjoy the outdoors with the Kentwood fire pit. Constructed with fiber glass reinforced cement, this fire pit is elegantly designed with natural stone and a decorative frame finish. The iron shield offers ample protection to enjoy chats fireside with your guests and is removable for those beloved smore nights. Adding this piece will bring warmth and elegance to your backyard or patio area, for those summer and winter nights. Constructed with fiberglass reinforced cement for durability. Features a protective iron shield. Contemporary style will add warmth and elegance to your backyard or patio. Ideal for entertaining guests outdoors. 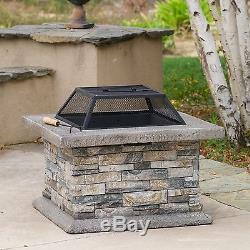 29" D x 29" W x 22.80 H. The item "Outdoor Patio Furniture Aged Natural Stone Finish Fire Pit" is in sale since Tuesday, January 27, 2015. 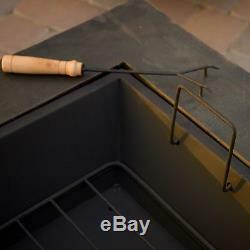 This item is in the category "Home & Garden\Yard, Garden & Outdoor Living\Outdoor Cooking & Eating\Fire Pits & Chimineas".